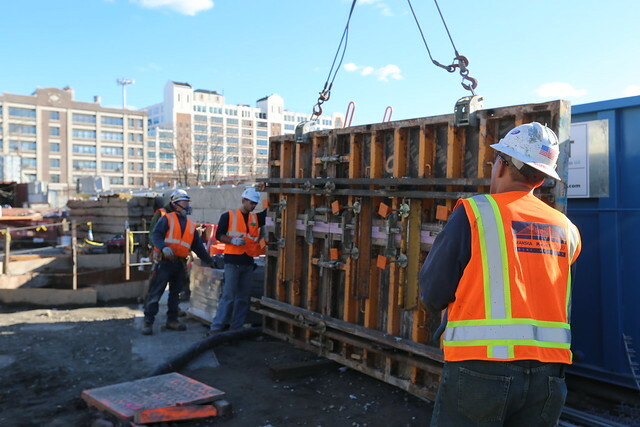 New York City Department of Environmental Protection Commissioner Emily Lloyd today announced that construction has begun on a $30 million project to build four litter capture devices that will improve the health and aesthetics of Newtown Creek. Much of the trash and debris found in New York Harbor, and its connected waterways, originates as litter discarded on city streets that subsequently gets washed into a catch basin and eventually makes its way into the sewer system. To help keep litter from reaching Newtown Creek, in late 2015 DEP began the installation of below-ground capture devices at four key locations within the sewer system in the vicinity of the Creek. The control devices include floating baffles and bending weirs to capture the litter and direct it to a wastewater treatment plant where it can be properly disposed of. Over the last three years, DEP has installed similar facilities along the Bronx River and the Gowanus Canal and they have captured more than 200 tons of litter and debris. Construction of the Newtown Creek facilities is expected to be completed, and the technology activated, in 2017. Council Member Costa Constantinides, Chair of the City Council Environmental Protection Committee, said, "The new litter capture devices will help keep Newtown Creek healthier and improve our city's sewer system. The devices will also prevent litter from reaching our waterways, one of our greatest resources. I applaud DEP Commissioner Emily Lloyd for her leadership on this issue and look forward to seeing a cleaner Newtown Creek." "We commend the efforts of NYC DEP to reduce floatable pollution entering Newtown Creek, which poses direct harm to the returning local wildlife and litters shores both local and city-wide,” said Program Director for the Newtown Creek Alliance Willis Elkins. “Less debris in the Creek is a positive step forward for the waterway and the communities that surround it. NCA looks forward to additional measures to improve the quality of this unique NYC resource." "We applaud this substantial financial commitment by DEP to advance the significant progress that has been made over the past few years to restore Newtown Creek, and return it to productive use for our residents,” said Patrick O’Brien, Chairman of Queens Community Board 2. “This is a very tangible expression of the dedication to the realization of that goal, and we thank Mayor de Blasio, Commissioner Lloyd, and the countless others that have labored long and hard on the Newtown Creek project. There is more to do, but this is a very welcome announcement that we embrace with open, and grateful, arms." In addition to the litter capture devices, the city’s 144,000 catch basins are designed to trap litter before it can make its way into the sewer lines. DEP also operates skimmer boats that patrol New York harbor to capture floating debris, including wood, plastic, metal, rubber, and glass. DEP has also partnered with the Department of Sanitation (DSNY), the Mayor’s Office of Sustainability and GreeNYC to initiate a new public information campaign aimed at reducing consumer waste and street litter while also helping to improve the health and aesthetics of local waterways. The campaign will build upon the success of GreeNYC’s recent “B.Y.O.” (Bring Your Own) effort and aim to address these interconnected problems by reducing the amount of consumer waste produced in the first place. Working with small businesses, the campaign will encourage New Yorkers to use reusable mugs, bottles and bags rather than their disposable counterparts, and digital ads and posters on bus shelters and DSNY trucks will help remind New Yorkers to bring reusable items when they’re on the go. In addition to addressing the issue of street litter and marine debris, the campaign will help to meet the OneNYC goals of sending zero waste to landfills and reducing waste disposal by 90 percent by 2030. DEP has already committed approximately $600,000 to the campaign. DEP manages New York City’s water supply, providing more than one billion gallons of water each day to more than 9 million residents, including 8.5 million in New York City. The water is delivered from a watershed that extends more than 125 miles from the city, comprising 19 reservoirs and three controlled lakes. Approximately 7,000 miles of water mains, tunnels and aqueducts bring water to homes and businesses throughout the five boroughs, and 7,500 miles of sewer lines and 96 pump stations take wastewater to 14 in-city treatment plants. DEP has nearly 6,000 employees, including almost 1,000 in the upstate watershed. In addition, DEP has a robust capital program, with a planned $14 billion in investments over the next 10 years that will create up to 3,000 construction-related jobs per year. This capital program is responsible for critical projects like City Water Tunnel No. 3; the Staten Island Bluebelt program, an ecologically sound and cost-effective stormwater management system; the city’s Watershed Protection Program, which protects sensitive lands upstate near the city’s reservoirs in order to maintain their high water quality; and the installation of more than 820,000 Automated Meter Reading devices, which will allow customers to track their daily water use, more easily manage their accounts and be alerted to potential leaks on their properties. For more information, visit nyc.gov/dep, like us on Facebook, or follow us on Twitter.